Website of the Long Lake Area Association of Hubbard County. ▶︎ First, the Enbridge’s Proposed Line 3 Replacement is the exact same route as the now tabled Sandpiper line which runs through Minnesota’s cleanest waters. It is not a “replacement” in the normal sense of the word. It is abandoning the current Line 3 Pipeline, leaving it where it is, and building a new one on the same route that they originally proposed as the Sandpiper Pipeline. It puts Park Rapids water supply at risk along with area lakes and rivers. 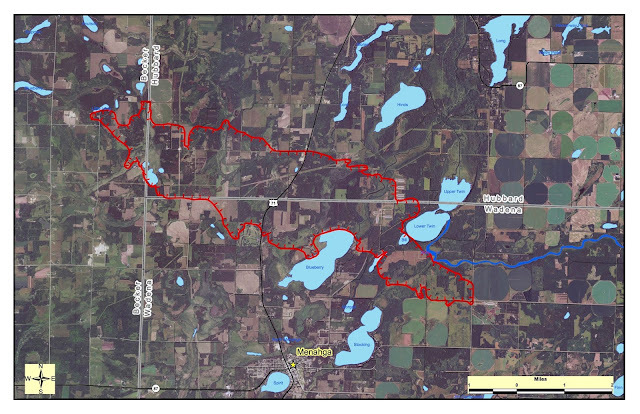 You can read the details of it’s impact specifically on Hubbard County here: http://www.hubbardcolamn.org/county-impacts.html You will also find information and links to alternate route proposals in the article. ▶︎ Second, DNR Firewise specialist, Dan Carroll, spoke about Long Lake as "Priority 1" for Park Rapids. It’s populated and dense with trees. On Long Lake’s west side from Hubbard to Hafner’s Greenhouse on170th Street and the entire area east of County Road 6, there are 1200 structures. Long Lake is 9 miles long; the Green Valley fire was 9 miles long. The Green Valley fire had 30-40 mph winds behind the fire from the west and northwest, which is unusual. Fire typically feeds on south or southwest wind. There are things we as homeowners can do to help prevent fires now. For assessment assistance or questions, contact Dan at 218-732-3309, the local DNR forestry office. The plot shown below is of the Green Valley 2013 Fire, courtesy MN DNR. call Nicole Kovar, Invasive Species Specialist - MNDNR at (218)-732-8960. To report an emergency wildlife situation: the appropriate person from the DNR will be contacted by the Sheriff's Office when you call them at (218)-732-3331. A History Lesson in Long Lake Lot Economics!